I combined Mojo’s Monday’s layout challenge with the color challenge from The Shabby Tea Room to create this little trinket or gift box. The Shabby Tea Room website can be seen by clicking on their blinkie under my photo on the main page. Below are both challenge photos. Here is a little peek at the inside, sides and front of the trinket box. My details beyond the Michael’s $1.50 box and Recollections flowers are a bit sketchy. The ink I used was Distress Pumice. The little button is from Dress It Up; the stretch ribbon and brown sparkly velvet ribbon are from Hobby Lobby as well as the Paper Studio Pearls. 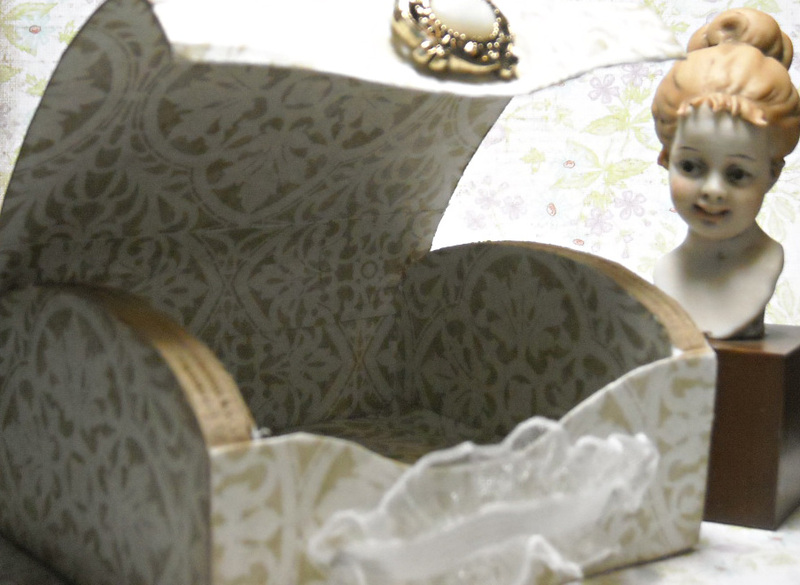 I used a Spellbinders Fleur de Lis die for the paper piece around the edge of the lace. All the rest is from my stash!! I have ten of these little boxes all primed and ready to be embellished for the Holiday Bazaar. The box shown is my “trial run” for what to do or not do on the next ones. Since it took me about four hours to finish this primed box, I think I’m going to have to do the rest a little differently if I ever expect to get them all done! I will have to be a little more careful with my sanding; I noticed a rough patch on one corner. The camera always shows me what I have to do next time! 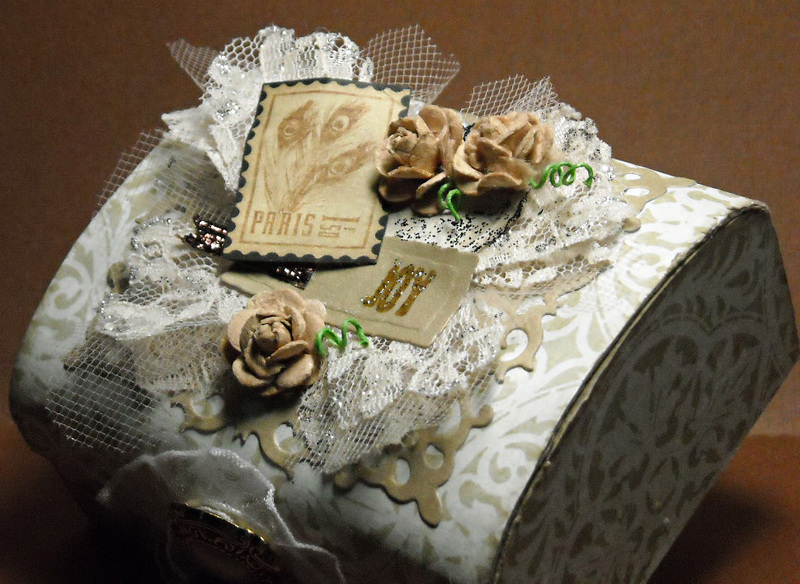 This entry was posted in art, papercraft and tagged altered art, beige, box, brown, feminine, lace, monochromatic, pearls. Bookmark the permalink.